One interesting feature is the crossover to transition to/from left and right side driving. 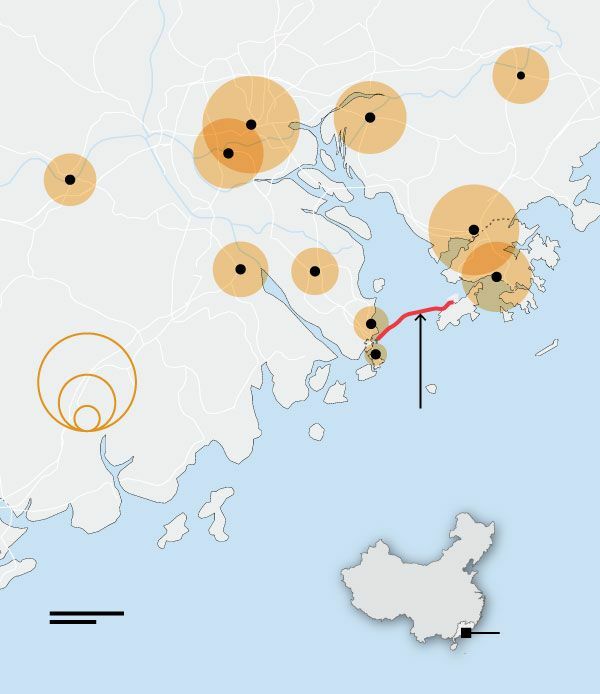 HONG KONG—The world’s longest sea bridge is set to open on Tuesday, snaking 34 miles across China’s Pearl River estuary to form a pillar of Beijing’s plan to merge 11 cities in its southern region into one megalopolis. Hong Kong has paid about $15 billion toward completion of the bridge and the associated construction costs. The question of who can use the Y-shaped bridge, which opens to traffic on Wednesday, underscores the challenges of integrating three different systems. In Hong Kong and Macau traffic moves on the left side of the road; in mainland China people drive on the right. The solution? Cars switch sides of the road at a specially built merge point, located at the viaduct at the mouth of the bridge link in Hong Kong. Private vehicle owners also need to obtain separate licenses for each city, which are subject to stringent quotas, making it impractical for most drivers. The project consists of three cable-stayed bridges, with connecting roads and a sea-crossing tunnel that route through artificial islands. The government has said that is it built to last a century and to withstand earthquakes and megastorms. The bridge remained unscathed after a supertyphoon called Mangkhut sucked out office windows and uprooted hundreds of trees across the city on Sept. 14. The ride on the bridge will offer spectacular views of the Hong Kong airport, a panorama of Shenzhen Bay, and the ridges of Lantau island, with a large Buddha statue sitting on top of them. Yet in order to enjoy the scenic ride, one has to first complete a two week-long document hunting process: a closed roads permit in Hong Kong, license plate in Macau, car insurance in Macau or China. Getting all these documents will take at least 12 business days; hence a hopeful driver must plan well ahead. Yet, the permits, valid for two years, do not automatically guarantee an entry on the bridge. That permit will only be granted to 150 private cars a day and the applicants – Hong Kong permanent residents only – have to prove they are employed or have a firm in Macau. If there are more than 150 applicants on any day, and licenses will be distributed via a lottery. The lucky drivers will still not be able to make it all the way to Macau: they must leave their cars in a car park just before the entrance to Macau and continue with public transport or taxi. Sick! Now let’s build one connecting Ventura to Santa Monica. Isn’t there another border crossing between left-hand-drive and right-hand-drive nations that has a flyover where vehicles change sides of the road? There are one or two from Macau to Mainland China. Traffic also switches from Hong Kong to China, so such a crossing has its precedent in this area. There is also a switchover bridge at the border of Guyana and Brazil. There might be more. The bridge is 3x3 on all the bridge sections shown, which will have excess capacity due to the legal restrictions on traffic. But if the bridge is designed for an 80+ year timeline, the capacity may eventually be needed. Neither of the reports mention if the bridge is tolled, and if tolled what the rate is. Unfortunately there’s no footage of the flyover. Also, the capacity won’t be needed unless the import-export restrictions are relaxed. The toll rate for passenger cars is 150 RMB, or about $ 21 - 22. At least for the foreseeable future, if only 150 people per day can use it, it's WAY over capacity (to the point where one would wonder why it was even built at all). This makes me think China is probably intending to end "one country two systems" once the 50 year minimum agreed to when the colonies were handed over ends in 2049. They've already begun working to undermine Hong Kong's culture of freedom and civil liberties and make them more like the tightly controlled mainland. Once 2049 hits, the only reason they'd have for maintaining "one country two systems" is to try to convince Taiwan to renounce its independence. I think the 150 limit is only for Hong Kong private cars. There seems to be slots for 150 Hong Kong company cars and 600 Macao private cars (don’t know about Macao company cars or PRC cars), and most of the traffic will probably be trucks and buses. What are the future plans for traffic access? Say in 5 years and 10 years? The restrictions appear to be on Hong Kong residents, but what about Mainland China? It's understandable that the road network of Hong Kong cannot absorb a massive influx of vehicles from Mainland China. what about a flood of trucks?